BTC/USD has lost 2.4% on a daily basis amid resumed sell-off. UK lender created a task force to investigate crypto opportunities. Bitcoin has settled below $7,000 handle after a short recovery attempt. The digital coin No. 1 touched $7,164 on Monday, but 50-SMA (1-hour chart) effectively capped the upside. BTC shed $20B of its value just in 7 days amid deep sell-off triggered by forced position liquidation on OKEx. Currently, a single Bitcoin is changing hands at $6,930, which is 2.3% lower since this time on Monday. Barclays seeks to investigate cryptocurrency market opportunities, but the news seems to have fallen deaf ears, as traders continued selling Bitcoins despite some signals of institutional adoption. The UK lender has created a team that will be engaged in exploring the ways to get exposed to cryptos and the means to integrate the digital asset trading desk into its current business. 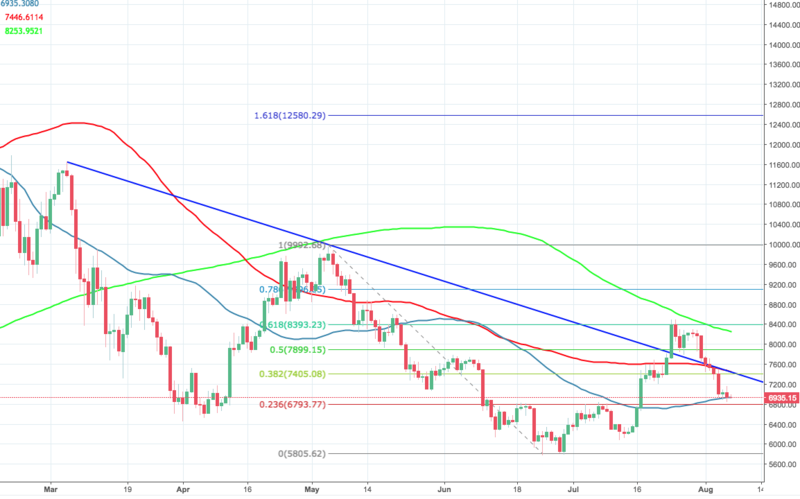 Technically, BTC/USD is capped by 100-DMA, while 50-DMA is under threat. A sustainable move lower will increase bearish sentiments on the market and push the price towards $6,800 guarded by 23.6% Fibo. On the upside, a recovery above $7,000 is needed to mitigate the bearish pressure. The next aim is at $7,446 (100-DMA).